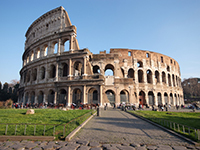 Italy is home to some of the most famous pieces of architecture in the world, with the Colosseum, St Peter’s Basilica and the Leaning Tower of Pisa drawing in large crowds of tourists from all over the world. Depending on your holiday plans, the amount of attractions and sights to see in Italy often result in a lot of travelling, especially when walking between nearby places of interest. Around 2.5 million British nationals visit Italy each year, which can be accessed from the United Kingdom either by airplane or a lengthy journey by train or car. On average, a train journey from St Pancras International station in London to Milan will take at least 17 hours, while driving the same journey will be a minimum length of 13 hours. A flight from London to Milan, meanwhile, can take a minimum of two hours. Italy is one hour ahead of British Summer Time and two hours ahead of Greenwich Mean Time, which should not necessitate major changes to your diabetes management. The average climate in Italy is comparatively much warmer than the UK, with average high temperatures in Rome summers reaching up to 33°C. Prolonged periods of activity, such as walking, can result in enhanced insulin absorption in warm weather so you could consider reducing your dosages if you are worried about hypoglycemia. The currency in Italy is the Euro, although many restaurants, hotels and shops will accept credit and debit cards, while money can be exchanged within hotels and money exchange services. There are no mandatory vaccinations required to enter Italy, however rabies is present in bats in Italy, so it is advised for those planning activities in remote areas that put them at risk for bat bites to receive a rabies vaccine. Italy is amongst the European countries that allow you to receive state healthcare either at a reduced cost or sometimes for free. It will cover you for medical treatment until you return to the UK. Medication is available in Italy, but payment is required from a pharmacy, for which the Italian translation is “Farmacia”. However, possessing an EHIC card allows you to receive treatment at a lesser cost and this money can be recouped when you get back into the UK. Blood and urine testing kits are available from many pharmacies in Italy. The emergency services telephone number to be called in Italy is 118. It is advisable to contact the manufacturing company of your medication prior to leaving the UK to find out what is available in Italy if your medication gets lost, stolen or damaged. It is also worth checking to see what different names your medication may be listed as. You should note which syringes are available in Italy, with U-40 syringes the most commonly used. What language is spoken in Italy? Italian, although many locals will have a basic grasp of English, especially those that work in a customer service environment.